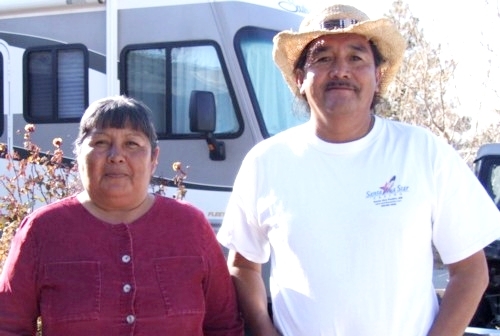 Torevia and her husband Delbert Crespin live at Santo Domingo Pueblo with their family. They are famous for their multi color necklaces and large inlaid pieces. Torevia's brother Pula Calabaza was one of the first at Santo Domingo to start making this pattern of chokers. She is the youngest in that family. The materials used in their necklaces are: jet (black), pipestone (brown), Melo shell (white or orange), spiny oyster shell (dark orange or red) turquoise and anything green is usually serpentine or turquoise. Do to the handmade nature of bead work, all bead sizes are approximate. Santo Domingo's do not use calipers - work is sized by eye. Made from white melo shell. The bird and side tabs are inlaid on jet with melo shell, turquoise, coral and jet . The bird is 2.75" side and 3.75" tall. Strung with melo shell beads graduated from 12mm. 20" long without the bird. These necklaces were originally sold at the train station at Santo Domingo during the Depression (1920's and 30's) to visitors stopping to stretch their legs and buy some of the local color while the train filled up with water. Torevia started to make them again using most of the same materials: shell, turquoise and spiny oyster. She inlays them on jet however, they did use old 78rpm records or battery cases. The necklace is 24" long. The thunderbird (a water symbol) is 3" x 3.75". Traditional thunderbird. Inlaid on jet with apple coral , orange melo shell, jet and turquoise. The bird is 3" wide and 3.75" high. Beautifully done necklace. Inlaid on jet with coral, turquoise, jet and Mother-of-Pearl Shell. The tabs are 1 1/8" long and 7/8" wide graduated. Strung on jet beads. The necklace is 21" long. Inlaid on both side on jet. The back side is turquoise, the front is inlaid with MOP shell, turquoise, jet melo shell, turquoise, lapis, and serpentine. It is 5" long and 1.75" wide. The 3 strands of coral are graduated from 10mm.The necklace is 18" long adjustable to 21". The tabs on this necklace are inlaid on jet with green Nevada turquoise, coral, jet and Mother-of-Pearl. They are 1 3/8" long and 7/8" wide. The necklace is 18" long adjustable to 22". Finished with jet beads. Lapis nuggets with accents of turquoise, melo shell and coral. The pendant is inlaid on jet with MOP shell, turquoise, coral and jet. It is 2 inches long and 1 inch wide. It is 20 inches long adjustable to 22 inches. The nuggets are 1/2 inch in diameter. Inlaid on jet with turquoise, coral, MOP shell, serpentine, pipestone, jet, abalone, purple spiny oyster shell and lapis. I've probably left out some. The center tab is 2 inches wide and 2.5 inches high. Finished with jet beads and SS beads and cones. 20 inches adjustable to 25 inches with a SS chain. Then Necklace is made from white melo shell. It is 25 inches long. The beads are graduated from 1 inch. The drums are inlaid on jet with turquoise, jet, white and gold-lip MOP shell, coral, melo shell, pipestone and serpentine. they are 1 inch in diameter and 1 5/8 inch long. The tabs are inlaid on jet with turquoise, coral, serpentine, MOP shell, melo shell and jet. The tabs are 1" by 3/4" in size. The beads are 6mm Jet. The necklace is 19 inches long adjustable to 23 inches. This large bib necklace is made from melo shell, pipestone, jet and turquoise. It is 28" long, but add another 3" to the length for the longest strand of the bib. The beads are graduated form 12mm (1/2"). This large bib necklace is made from melo shell, pipestone, jet and turquoise. It is 28" long, but add another 3" to the length for the longest strand of the bib. The beads are graduated form 6mm (1/4"). These earrings are strung on a post with various materials. Very colorful. They are 2.75 inches long and the beads are 5mm in diamter. Ask for pictures to chose. Or tell me dark or light, plain or multi. Torevia Crespin made these bracelets. They come in brown(pipestone), Black (jet), and Melo shell (white or orange). They are 7" - 8" in length. The beads are 5.5mm in diameter. Then Necklace is made from jet. It is 25 inches long. The beads are graduated from 1 inch. The drums are inlaid on jet with turquoise, jet, white & gold-lip MOP shell, coral, melo shell, pipestone and serpentine. they are 1 inch in diameter and 1 5/8 inch long. Delbert or Torevia Crespin made these earrings. Inlaid on turquoise with jet, coral and MOP Shell. They are 2.5 inches long with the wires and 3/4 - 1inch wide.